Royal Bank of Scotland is 70-percent government owned. London, England (CNN) -- The Royal Bank of Scotland has agreed to pay a fine of £28.6 million ($43 million) after admitting breaches of competition law, Britain's Office of Fair Trading announced Tuesday. The fine was reduced from £33.6 million ($50.6 million) because RBS, one of Britain's top banks, admitted the breaches and agreed to cooperate, the office said. RBS is 70.3-percent owned by the British government after it received a £37 billion bail-out in October 2008 at the height of the financial crisis caused by the collapse of the U.S. sub-prime mortgage sector. An OFT investigation found that employees in RBS's Professional Practices Coverage team had given confidential future pricing information to their counterparts at Barclays Bank between October 2007 and March 2008, the OFT said. The information was about the pricing of loan products to large professional services firms like solicitors, accountants and real estate firms, the OFT said. 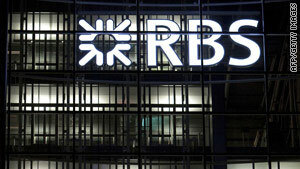 Barclays and RBS are the main providers of those products. Barclays used that information to determine its own pricing, the OFT found. The breaches came to light when Barclays reported them under the OFT's leniency policy, in which the first company to report its participation in an infringement may be immune from penalties. Barclays is not expected to pay a fine in the case, provided it continues to cooperate, the OFT said. "It is important that companies operating in the UK understand the seriousness of such conduct and ensure effective competition compliance throughout their organization," said Ali Nikpay, senior director of cartels and criminal enforcement at the OFT.